SXSW 2011: The Kills, Live In Concert Alison Mosshart and Jamie Hince headed to Austin with an album's worth of new material. 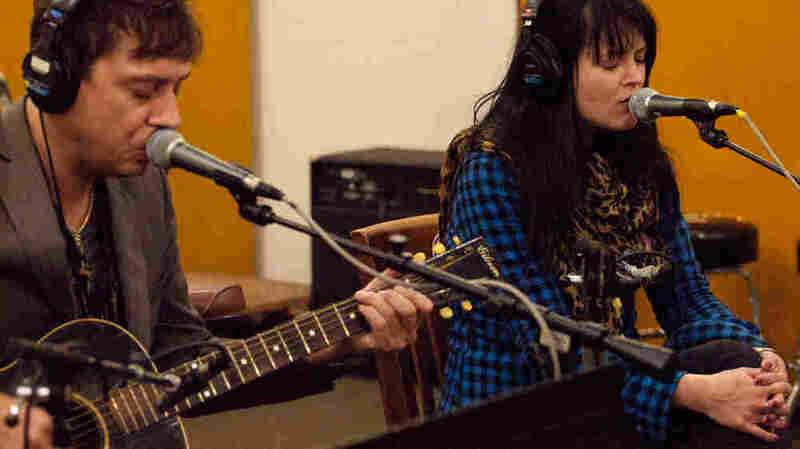 Here three songs from the duo's upcoming LP, Blood Pressures, live in the KUT studio. The Kills perform an intimate studio session on KUT during the first day of SXSW. Jamie Hince of The Kills is obsessed with tension. Between playing three stripped-down cuts from the band's upcoming album on Austin's KUT, Hince explained his penchant for playing songs just a bit faster or slower than their natural tempo. He likes letting them sit, unchanging, at a constant pace, seemingly building towards some release that never comes. While many bands would take a drummer over a metronome any day, the duo says it's doing just fine without one, preferring to assemble its songs around one steady, rhythmic tick. "Satellite", the lead single off the aptly named Blood Pressures, pulses along to one reggae-tinged beat, while "Baby Says" follows one driving note, constructing a fuller sound around it. The band closed out on "Pots and Pans," a number that plods along to muted strums, stomps and heavy vocals from Alison Mosshart. Even when the song opens up to let Mosshart's lyrics trudge atop more resonant chords, it never strays from that one hypertensive note coursing underneath all along. The broadcast on KUT was recorded and mixed on Cliff Hargrove and hosted by Jay Trachtenberg.